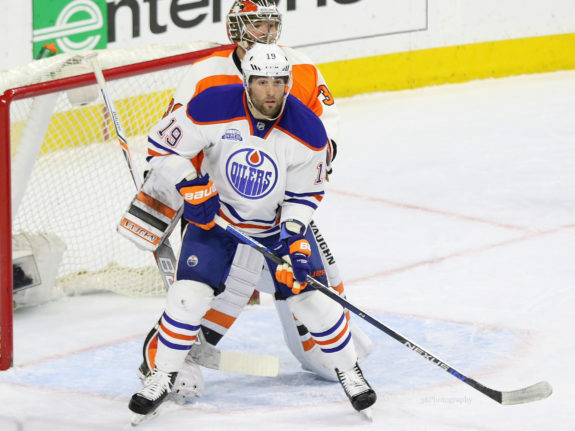 In a last-minute trade deadline deal, the New Jersey Devils acquired left-winger, Patrick Maroon, from the Edmonton Oilers in exchange for a 2019 third-round pick and prospect, J.D. Dudek. Maroon, 29-years-old, has 14 goals and 30 points in 57 games this year and should help New Jersey add some more scoring for the stretch run. 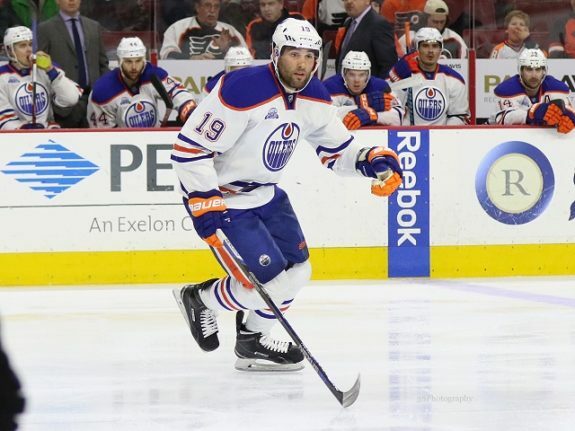 In his time in Edmonton, Maroon had seen his offensive production skyrocket. He scored 49 goals in 154 games, which comes out to a 26 goal pace over an 82-game stretch. He also did a good job getting shots on goal, with 178 last season and is currently on pace to finish this season with around 163. Maroon’s five-on-five numbers are pretty impressive as well. Since 2016-17, the Oilers had a 53.3% Corsi For (CF%) and were 3.9% better in possession with Maroon on the ice. They also had an expected goals (xGF%) of 54.5% when Maroon was on the ice, which was second best to Connor McDavid. Granted, his numbers were helped by playing with McDavid, but he was far from a drag to him or his other line-mates. If he were, he wouldn’t have seen the time that he did on the Oilers’ top line. On top of his on-ice stats, Maroon found success at an individual level. He averaged 1.74 points per 60 minutes, which is just about equal to Anze Kopitar and Rick Nash since 2016-17. He also chipped in 35 goals, which is second best on the Oilers to Connor McDavid and has a goals per 60 minutes of 1.05, which is slightly ahead of McDavid’s rate of 1.01. Although Maroon spent a lot of time on the first line in Edmonton, I wouldn’t hold my breath on him playing there regularly with the Devils, even though he’s definitely capable of it. That said, the Devils seem to have a good thing with the trio Hall, Hischier, Palmieri and would be best off keeping them together as their top unit. With the organization still hopeful that Marcus Johansson will return this season, they could use someone to fill his spot on their middle-six lines. Whether Maroon is that player or not remains to be seen, but it seems likely that’s where he’ll fall once the dust settles and he gets a few games under his belt. While he may not have the speed as some of the other team’s forwards, he’ll give them size at 6’3, 225 pounds while adding some scoring punch beyond their first line. In addition to his size and scoring capability, Maroon will bring valuable playoff experience to a team that hasn’t seen a taste of it since the 2011-12 season. He has 26 points in 42 career playoff games between the Ducks and Oilers. If the Devils do end up qualifying for postseason play, there’s no doubt he will be a valuable asset when the time comes. Given the price of what some other rentals went for, I’m quite surprised Ray Shero only had to hand over a third-round pick (in 2019, too) and a middling NCAA prospect for Patrick Maroon. The return for Maroon seems pretty low for a guy who has played at a 25-goal/82-game pace last two years, no? Not really a prospect in that deal and the third-round pick will be low-ish.. I completely agree with what Travis is saying here. The Oilers have been playing Maroon with McDavid for quite some time, so they clearly valued his presence. If that’s the case, then why wouldn’t the return for him be higher? Even though not impossible, it’s not all that likely that a third-round pick becomes an NHLer and the acquisition of Dudek isn’t all that inspiring, either (he has just 17 points in 33 games as a junior at Boston College). There’s no doubt the Oilers could’ve, and probably should’ve gotten way more for Maroon than they did yesterday. From the Devils perspective, they really came out on the right end of this deal. They get someone who’s on pace to finish the season with 40-41 points, and they didn’t give up a whole lot to acquire him. Ray Shero had previously emphasized he wasn’t looking to mortgage the team’s future as a short-term fix. In acquiring Maroon and Michael Grabner, they managed to do just that while improving their team at a minimal cost. They’re now in prime position to clinch a playoff berth and should have the firepower to do so as they enter the final weeks of the season.